The tricep rope is one of the most familiar pieces of gym equipment, appearing in almost every gym in the English-speaking world. It’s designed to attach to a cable machine and allow you to perform tricep pushdowns and bicep curls. We love the cable machine because it’s a versatile piece of equipment and provides you with a lot of ways to work out, at home, with constant tension. The tricep rope isn’t just for triceps, despite its name. It’s a rope attachment for the cable machine that makes tricep pushdowns more effective, improves your bicep curl, and gives you access to dozens of movements that will seriously benefit your training. Exercises like the face pull are underrated but provide a great way to train the rear delts and other muscle groups that you might neglect using a straight bar. It also forces you to stabilize both sides during these types of exercise, as the rope is held in the middle but not attached. This builds great strength and control. You can also use the rope for T-bar rows and other types of exercise if you feel like getting creative – it’s not just for the cable machine! This is a great product, by-and-large. It provides a thick, heavy-weave nylon rope with a 1.5” size. This is slightly chunkier than many we’ve seen on the market, so it provides great durability for regular exercise. The size also makes grip a non-issue, despite using synthetic rope. The price and overall customer-satisfaction with this product also seem great. It can be bought for less than $20 and has an average rating of 4.5 stars across 400 reviews. 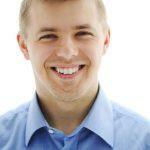 Where the reviews are negative, they do tend to be dealing with delivery concerns. Make sure you’re allowing plenty of time for delivery and resolution of any concerns. Some customers have complained about difficulty in keeping the rope centered. This is a mixture of 2 concerns: firstly, it’s meant to be like that – it requires balance and stability. However, the second problem is legitimate – the angle of the attachment hook is perpendicular to the rope itself. This can be a problem because it can easily bias one side. The biggest problem we’ve seen with the CAP rope is that around 1-2% of reviews say that the end-caps to the rope are susceptible to falling off. This is obviously a big problem as it defeats the point of the whole product. While this isn’t common, there are a few reports of defective or misshapen products being delivered. This isn’t a reason to avoid the product but be sure to double check and familiarise yourself with the returns policy before purchase just in case! With larger grips than many other models on the market, this is one of the easiest ropes to grip. This can be a real benefit to anyone who is new to training or wants to remove the grip limitation from their tricep exercise. 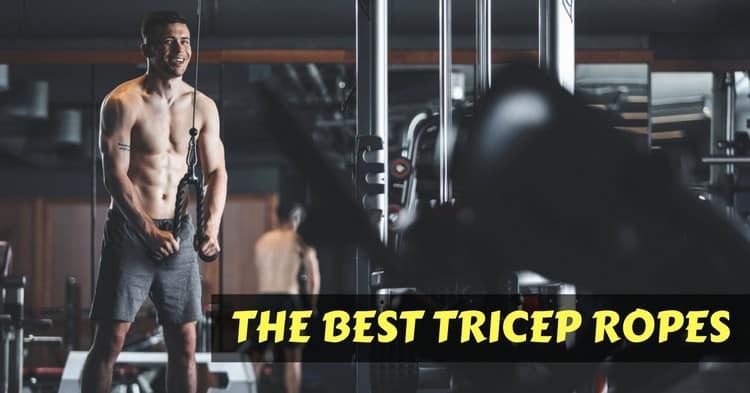 This is a great positive for almost anyone – especially since tricep pushdowns tend to be aimed at longer sets where grip endurance might be a challenge during fatigue. Otherwise, there’s very little to set the Yes4All and CAP ropes apart. The reviews and features are similar across the board – down to the problems with the end-caps falling off. This is a common build-problem with this type of product, so it seems that it is going to be common across brands. The other build-problem that we’ve seen is that the metal attachment is somehow not attached to the rope. This seems like a crucial problem since it makes use impossible – though it only showed up in one review. The risks are comparable to the CAP model, so make sure you keep your eyes on the returns policy. Otherwise, the worst thing that has been said about the Yes4All rope is that it carries an “awful chemical-like smell” that fills the room. We’re not sure what to make of this or what causes it. If you’re training in an enclosed home-gym that links to living areas it might be worth avoiding, but otherwise, this shouldn’t be a huge problem. This is the cheapest rope on this list, though it has the same design and features that we’ve seen with other models – down to the length. 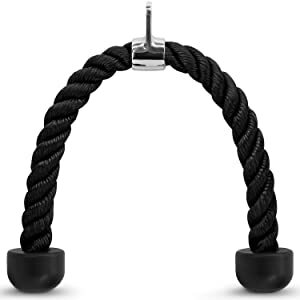 The problem with getting an accurate review of this product has been that the product page for the rope is crossed over with the v-handles used for rows and other movements. The rope for this product is slightly narrower than we see on the CAP rope – at only 1” in diameter. This makes it slightly thinner than competitors. This could make it a better choice for those with smaller hands, though it’s unlikely to make a real difference to use once you’re used to it. The reviews on this product are overwhelmingly positive, though we found that the best responses were to the V-bar, rather than the rope itself. The negatives for these products tend to be noisy attachments (which are easily fixed with a little oil) and shipping/construction problems similar to the CAP or Yes4All models. At first glance, our favorite thing about the Harbinger rope is the cool-looking red interwoven rope. The rope itself is a mid-ground between the 1” and 1.5” models, at 1.25” of rope-grip. This makes it appropriate for pretty much everyone. The grips on this product are contoured and rubberized but the texture is more pro-grip, which makes them a more serviceable grip – rather than just stopping slips. This adds a totally new dimension to training with the Harbinger rope compared to others. The “Receiver” attachment on this product is also great. It’s set in parallel to the rope so that you can attach the cable without any bias – a problem that has shown up with other products on this list. This should prevent most of the centering problems and keep the ropes even (as long as you’re even!). The harbinger model also offers a choice of lengths – both 26 and 36 inch versions are available. The 26” is competitive with the others on this list at, while the 36” custom-build is more expensive but there aren’t many 36” ropes on the market. For most people, the 26” model is going to be suitable and will keep costs down. The added color isn’t just for show, either – many of the reviews have mentioned that it has a great unintended purpose of not arousing suspicion if you take your own rope to the gym. It won’t look like you’re stealing because it’s got such an obvious appearance. In fact, the only 1* review on this product complains that the color wasn’t the one they ordered. Clearly, the design is a winner! The other negative reviews are almost-comical, too. One complains that the rope is hard and scratchy, which is the result of using a synthetic rope-weave – as with other ropes on the list. Another complained about the rope being too short – a problem that is easily avoided by buying the 36” model. Figure out your needs for this product before buying! Another entry that strikes us as identical to the CAP, Y4A or A2Z models. Visually and functionally, they’re the exact same: 27” rope with a perpendicular receiver and 1” of rope diameter. There’s nothing that stands out to us with this product. With that said, it provides a competitive price and the same heavy-duty uses that were discussed with other products. This is marred by the same initial smell that has been seen with others on the list – reviewers found it prohibitively stinky. That’s an impressive amount of smell for a piece of workout equipment! The receiver on this rope is often subject to variation, too: it has a more static position, which means that some buyers found that their rope was off-set by as much as an inch. This is a bit of a problem since, of course, the imbalance transfers to your muscles and posture. It’s not likely to be a huge problem, but this hasn’t been seen consistently with any other products on this list. Valeo’s manufacturing practice and customer service also get a bad showing in the reviews of this product. Buyers report that the rope is not the stated 28” but 26”, which wouldn’t be a problem but their attempts to deal with Valeo’s customer service department are overwhelmingly negative. This is a concern for anyone who has other options (like those listed above) or needs a high production accuracy. If you need to return this product or want to address problems with construction, this does put us in doubt of the vendor. They’re a well-known company but with the combination of production defects and poor customer service, this product just doesn’t make sense as a purchase compared to others on this list. 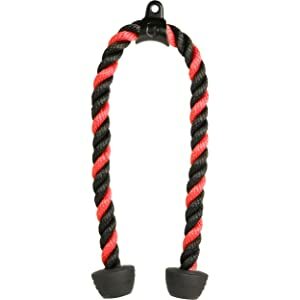 Our favorite rope on this list is the Harbinger 26” rope. This makes a lot of sense to us because it has great construction quality, very few reasonable negative reviews, and a general reputation as being durable. The important part, however, is that Harbingers product actually looks like it was built in response to gym-enthusiasts’ needs! 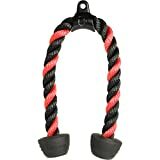 The rope design is attractive and distinctive, the grips are functional by themselves (and they don’t fall off), and the attachment has a better balance than others on this list. The CAP, Yes4All and A2Z products are all suitable if you’re on a very tight budget, but if you’re able to spend the extra cash on the Harbinger rope, you’ll definitely see the difference in quality. All that’s left to say is that there’s no real reason to shoot for the Valeo rope when we look at the features and the alternatives on the market! Harbinger takes the win, Valeo takes the loss, but everything else sits in the “middle of the road”. When buying for your home gym, it’s an investment and a higher-quality product means buying once and avoiding customer service problems and returns!